It’s no secret that we love all things green at Bonterra. When it comes to cleaning, it can be tricky to be as environmentally responsible as we’d like (so many chemicals!). As we look to spring (and really, all year-round) cleaning, we want to share some tips from our amazing friends at Dr. Bronner’s. They’re a Certified B Corp, like us, and they only use the purest organic & Fair Trade ingredients in their products. No synthetic preservatives, no detergents or foaming agents — we like the sound of that. What’s even better? You can use their top-selling soap for everything; from cleaning windows to brushing your teeth (seriously!). Windows: 1 Tbsp. soap and a quart of water in a spray bottle. Follow up with pure club soda, or half vinegar/ half water. Lisa Bronner shares expert advice for making windows squeaky clean here. Fruit and Veggie Rinse: 1 dash (approximately ¼ tsp.) in a bowl of water. Dunk produce and swish. Then rinse in clear water. 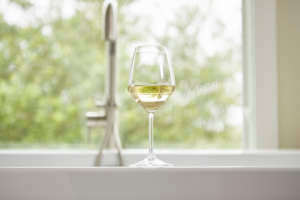 That glass of Bonterra will taste even better after your environmentally friendly chores are complete! We love seeing other companies do right by the Earth. Want to take a deeper dive into social and environmentally responsible products? Head over to DrBronner.com for more Earth-friendly cleaning tips!